Getsemaní, a neighborhood outside the walled city, once a poor area is now a hip place to visit. I accidentally found a B&B in this area, and it turned out to be conveniently located for visiting both the walled city and the Castillo San Felipe de Barajas. At times, specifically during the heat of the day, the 15 minute walk seemed just a touch long for a short rest in the A/C, but otherwise, the nightlife, restaurants, and eclectic feel was enjoyable. While I enjoyed the walled city, I found myself spend a lot of time outside of it as well. I stayed at Les Lezards Bed & Breakfast which is the number one Bed and Breakfast in Cartagena on TripAdvisor. The best part of Les Lezards to me, was the staff. Bertha was amazing. She told me not to take a taxi as I could walk every where day and night safely. She provided me some of her favorite restaurants in Cartagena. When not on site, she was extremely responsive on What’s App. And finally, I was trying to book a tour in Boquilla and my phone wasn’t working, so she called for me and arranged the whole thing! My room was really cute! It was called the Mexico suite. Each of the seven rooms included a different theme. The bedding and bed were nice. The towels, unfortunately were more like sand paper. Apparently the room was equipped with Apple Play and other nice technologies, but I didn’t use them. The internet was decent and there were plenty of magazines and books to choose from if needed. My biggest complaint was the open air shower as it allowed bugs into the room and let out some of the A/C if I forgot to close the bathroom door. In addition, while the hotel and guests were very quiet, some of the neighbors and their yapping dogs were not quiet which made for short nights. The breakfast which included eggs, a fruit plate, bread, cereal, and tea, juice or coffee was nice. I only got to take advantage of it once as the other mornings I had to leave prior to 7am. Another wonderful service the B&B offered was a ride from the airport. This made my transfer easy. Now I understand why though…I would have never found the B&B on its own with only a cute white door and no sign or address for the entrance! 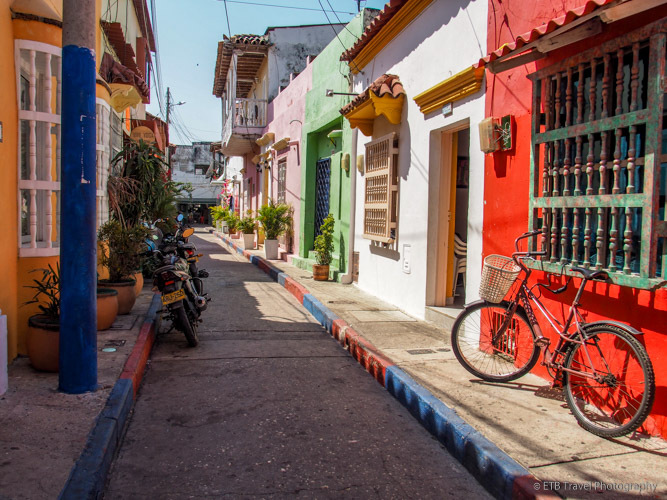 The first thing to do in Getsemani is to walk the colorful streets. Creative murals don several walls as flags hang overhead. It is a vibrant community both day and night. Getsemaní is known for its tasty restaurants and street food. I visited four restaurants while I was there and checked out the street food at the plaza in front of the Iglesia de Santísima Trinidad. By the time I arrived in Cartagena and got settled into my B&B, it was time for lunch. Bertha said Sorrento had the best fish in Cartagena. In addition, it was close by and on the way to the walled city, so I decided to try it. The restaurant was busy with a fun atmosphere. I found one four top table free inside. I ordered Filete al Ajillo and was served the token soup quickly. After that, however, I think they lost my order. Two other tables that were seated after me got their food before me! Eventually, my fish made it to the table and I shoveled it down as I was a bit ravenous, and I was eager to explore the city. One evening I visited Caffé Lunático, a tapas restaurant I read about on TripAdvisor. It seemed like a popular place. I waited until about 7:30pm to eat, but was still the second person there! Things start late around here. At least I got one of the two outside tables. People started trickling in after 8. In the meantime, I had already ordered and received my amuse bouche which I certainly wasn’t expecting. The food at Caffé Lunático was good and there was a great deal for two, but unfortunately tonight I was dining alone. I feel like I mis-ordered slightly. My first course was a broken egg, fried yucca and sausage bites. This turned out to be like fried eggs and bacon on a biscuit. It was tasty, though I had already had eggs for breakfast! Had I realized what I was ordering, I likely would have picked something more exotic. My next course was calamari with a mango salsa. The calamari was tender and the tangy salsa was fantastic. Finally, my potato omelet came. I really have to order this at any tapas restaurant as it is one of my favorite dishes, but with eggs and potatoes, it felt similar to my first dish. I was so stuffed just from the two plates, that I took the potato omelet home to have as breakfast the next day since I was leaving early to go fishing. For lunch the following day, I opted for beer and pizza. By this time, I had tired of fish which I had eaten almost every single day, sometimes twice a day. Many people on TripAdvisor recommended Beer & Laundry even if doing laundry wasn’t necessary. It was close by, so I decided to try it. This may have been my most favorite stop on my whole trip simply because Ivan and Lillian were so friendly. Before I entered, I stopped to take a picture of the store front, and Ivan opened the door for me. He greeted me kindly and asked if I spoke Spanish. I pinched my index finger and thumb together and responded, “Un poquito.” Then in Spanish, he replied, “Would you like to practice.” Why not, I thought. So he proceeded to speak to me slowly. I was able to understand his unhurried dictation with lots of arm movements and only required a few translations. This was kind of exciting since I really haven’t used Spanish for over 20 years. I got the nerve up to speak it as well. Lillian said I did well, but I think she was being nice. Anyway, the restaurant/laundromat was immaculate. I sat at a table with a view of industrial washers that were very clean. That made it easier to eat a thin, crust pepperoni and mushroom pizza that was really good! By the time I left, I knew the best place to get a mint lemonade and the best place to get a coconut lemonade, a staple in Cartagena. I also knew all about the crypt at the Santa Clara Hotel which used to be a convent. I would have completely missed this, thus I’m so glad Ivan told me all about it. I had such a pleasant experience at the laundromat! And what made meeting Ivan more interesting, is that he lived in Denver for nine months learning English!! Such a small world. So I asked Ivan at Beer and Laundry where the locals go to eat. He said the local food isn’t very good. Thus, for the most part I have been eating at pricier tourist places. He did, however, point to the map and say there is a restaurant right here where locals go. Without a name, I guessed that perhaps it was Bazurto Social Club, but I have no idea. We got there too early for the dancing, but Eric and Michelle enjoyed a drink and empanadas. Getsemani has a handful of plazas. My favorite one, eventhough I didn’t spend much time there was right next to my B&B. The small triangular space is favored in the evening. The popular Bonche Gastrobar, puts tables and chairs out in the plaza where diners listen to music. There certainly isn’t anything picturesque about this small area, especially in the day in the blazing sun, but the metal statues are humorous. One statue includes a man and a dog peeing on a light post and another depicts a dog pulling the pants down of a child! The ones in the walled city are less risqué! This plaza is large and extremely lively in the evening. Both locals and visitors come here to try the variety of street food and to watch the local entertainment such as dancers, flag throwers, and more. I can’t say the talent is terribly good, but at least they are enjoying performing. Arepas and kabobs were some of the street food choices without very long lines. One cart, however, cooked in waves…first hot dogs, then burgers, then a salad plate with a medley of meats, sauces, and crunchy toppings. Many people, including me, waited for one of these plates which was enormous. I didn’t find the Santa Isabel Foodtrucks until the last night after I had already eaten, but what a great place to enjoy the water and beautiful view of the walled city. I was surprised to see the place was not very crowded, though I stopped by well past dinner time. I think I would have loved this area for a quiet night and wonderful atmosphere. This monument commemorates an indigenous woman who was abducted by the Spanish and used as translator to speak to the indigenous people. She later married Pedro de Heredia’s (the founder of Cartagena) nephew. Monumento a los Zapatos Viejos is a giant bronze sculpture of old boots. The statue, created by Hector Lombana, is dedicated to respected, Colombian poet Luis Carlos Lopez and references his poem “Mi Ciudad Nativa.” The last line of the poem compares the love of and comfort in his home town which he feels well used pair of comfortable shoes. Located near the Castillo San Felipe de Barajas, it is an easy stop for a quick photo before or after visiting the castle. The Castillo San Felipe de Barajas is a fortress located on a Hill of San Lázaro. It was constructed by the Spanish in the colonial era to protect the City of Cartagena from land invasions. It was built in a triangular shape with many walls, batteries, and tunnels. The bunkers protected one another so it made it almost impossible to take over one battery unless the whole defense system was compromised. I visited the castle late in the day as I heard it provides a nice view at sunset. I also heard to buy a ticket and then pay a local guy $5 to lead a tour, as they congregate around the entrance. Perhaps due to my late arrival, I didn’t see any guides, so I just wandered around the ruins. In the process, I met a few nice people. A Canadian who asked me to go dancing at the famous Havana Club which I declined and a German lady who was visiting Colombia for a month and waiting to see the sunset too. I had walked all the walls and been through all the tunnels, some of them dark at the end, well before sunset, so I almost left, but the plump German who was quietly resting on the bench made a good point…where do you have to be? So I simply sat down next to her and waited while having a pleasant conversation. I’m glad I did! This area includes the hustle and bustle of daily life including a grocery store, food carts, watch repair stalls, cell phone repair stalls and more. I wandered over there in hopes to find an arepa but failed. The carts mostly included ceviche and juices. I did stumble upon Michael Jackson though. Nice post! It seems I missed a lot when I was there — I will have to return with your suggestions! Great post! We stayed in the old part of the city but Getsemani seemed really cool. 😎😉 Its a beautiful city!